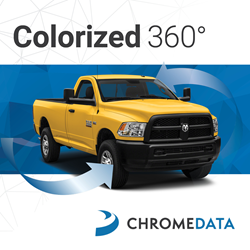 Chrome Data announces Colorized 360°, a new vehicle walk-around product designed to increase engagement and drive more sales. Chrome Data, the leading provider of vehicle merchandising solutions, images and incentives today announced the launch of Colorized 360°, a new vehicle walk-around product designed to engage customers and drive more sales. Using Chrome Data’s industry-leading vehicle images, Colorized 360° provides an interactive, customized experience that lets customers easily navigate between eight professionally colorized angles and stylized transitions for each new model. Chrome is the only provider that allows car shoppers to colorize their 360° experience. All images correspond with OEM color names, generic colors or specific option codes to simplify the search process. Colorized 360° is equipped with a configurable player that makes it easy to customize dealer branding, logos and special programs to increase brand awareness and store traffic. The mobile-first, responsive technology adapts to any platform and links directly to Chrome Style IDs, Acode and VIN data for seamless integration with VDPs, SRPs, campaign landing pages and more to deliver an exceptional user experience. Colorized 360° is also available at a reduced cost as part of the new Chrome Media Bundle package that includes the Chrome Image Gallery along with Model and VIN Virtual Test Drive Videos.